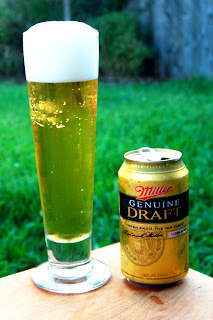 Originally branded as Miller High Life Genuine Draft, MGD was introduced in 1985 as the home version of draft High Life. It features the same recipe as High Life, but with a different production process designed to emulate draft beer in a can or bottle. After brewing, the beer is crashed down to 35 degrees, instead of undergoing the usual heat pasteurization. Once cooled, it is then cold-filtered four times, with the last filtration coming courtesy of ceramic filters. Despite it's relatively young age, Miller Genuine Draft has become the standard-bearer for the company, with the sales-leading Miller Lite as the light offering and Miller High Life as the budget heritage offering. Who doesn't like draft beer? Let's tap this bad boy and see if we can get the real straight from the tap flavor right here at home. Appearance: A crystal-clear straw-colored body capped by two fingers of bubbly, white head that feature decent retention and lacing. Aroma: Sweet and grainy pale malt with mild, lemony hops for balance. Taste: Surprisingly, there is a relatively substantial malt backbone here. While it’s hardly a lush base of caramel malt, it does feature some biscuity notes along with the usual grainy and husky character. That said, there’s little hop character here, just a splash of lemon. The finish is clean, with just a suggestion of slightly biscuity grain in the finish. Mouthfeel: A somewhat watery body with sharp carbonation and crisp finish. Drinkability: As usual with these beers, if you’re into the flavor profile there’s nothing holding you back. Verdict: While it’s still bland and thin compared to the rest of the beer world, MGD actually has a decent wedge of malty character for this style. Still, given a choice between this and its cousin High Life, I’d choose the latter every time.